Streetsblog Chicago’s resident urban planning wiz Steven Vance is anything but a boring conversationalist, but he keeps droning on. Check out these awesome aerial photos he took this evening of the complete streets makeover of Wicker Park’s North/Damen/Milwaukee intersection. If you ask him, Steven will tell you he took them during a ride in his personal hot air balloon. Note that the photo at the top of the post was taken a moment before the one below. 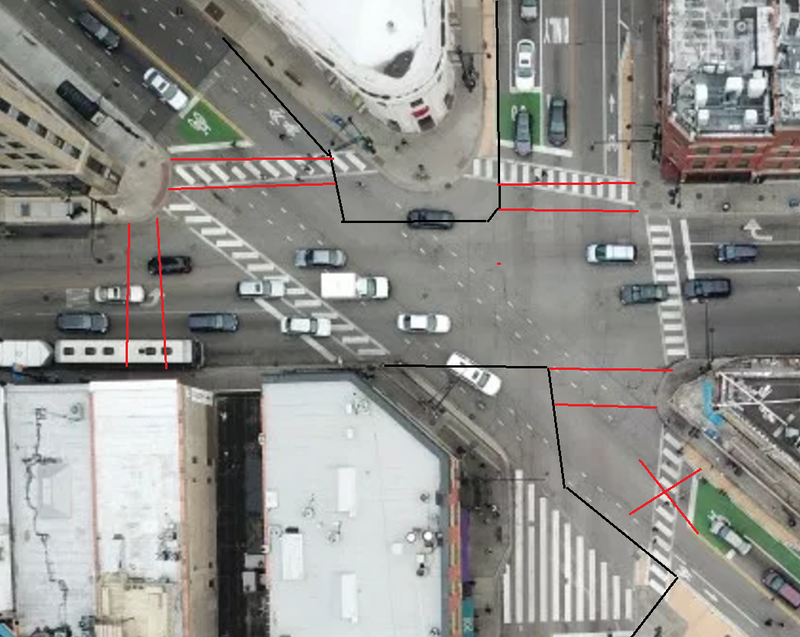 In these images you can clearly see the changes that the Chicago Department of Transportation made to organize the hectic intersection and make it friendlier to pedestrians and cyclists. “Dashed bike lanes” have been added to Milwaukee, the diagonal street, since the 42-foot-wide roadway is too narrow for installing conventional lanes without large-scale car parking removals. Note that the lanes are striped through the intersection. Green bike boxes were added to four of the intersection’s six legs to give cyclists a place to wait for their signal in front of motorized traffic. The bike symbols were just installed today, which should encourage drivers to stop behind the stop bar and not block the boxes. Tan paint and flexible plastic posts were used to shorten pedestrian crossing distances, eliminate the slip lane, and create more space for people on foot and possible features like planters in the future. Several other post-and-paint bumpouts along Milwaukee in Wicker Park were completed today. The stop bar at the south leg of the intersection was moved further from the junction to make room for a giant, triangular crossing area, which readers have said resembles volume bars or cell phone reception bars. The rest of the crosswalks have been upgraded with high-visibility zebra stripes. CDOT also plans to add two new crossings later this year or in 2018, between the east corner (the Flat Iron Building) and southwest corner (Flash Taco), and between the north corner (Walgreens) and the southwest corner (Starbucks). At today’s Mayor’s Bike Advisory Council Meeting, feedback from cyclists about the intersection makeover and the Milwaukee dashed bike lanes was overwhelmingly positive. One resident said he used to tense up while biking the stretch of Milwaukee between North and Division during his work commute. “Now that section is a pleasure to go through,” he said. >> “Now that section is a pleasure to go through,” he said. This may be true but the department’s job isn’t over yet. There are still many changes left to be made. potentially silly question as I’m in general favoring more service over less, but: why have a bus route on Milwaukee Ave at all, the sections that are hugged by the Blue Line? It is at least a coverage route. Meaning for elderly and partially handicapped users. If it carries a significant ridership then it would also be a ridership route. None of the stations between California and Grand, inclusive of both, and excepting Western, are accessible. But isn’t there other service that can be added for at-risk riders that would be of smaller scale than a full-service bus route? Trains and buses serve different purposes. The bus is usually more practical for short distances. For example, if I’m at Wood and Milwaukee and want to go to Western and Milwaukee (1 mile), without the bus, my option would be to walk 1/3 of the way and take the train one stop. No the best. The bus fills in the gap between train stations. You could run a smaller bus vehicle. Paratransit, another alternative, would probably be costlier than the present situation. The buses are surprisingly full. I live between the California and Western L stops and take the bus to Wabansia/Caton a few times a week to get my daughter to school. There are days when we have to stand, so there’s definitely a demand for it. While it is a reality based concept, the CTA doesn’t use it to manage their communications with us. So they end up setting ridership goals for a route that they created to serve a coverage demand. Failure by design. 11. What a rare sight to see–not the aerial shot, but the fact that most of the bike boxes are void of cars. I know the paint is barely dry, but my experience has shows me that the bike boxes are consistently ignored by drivers and the former-taxi-stand are consistently holding parked taxis. No enforcement, no respect. I know the paint is barely dry, but my daily commutes have shown me that the bike boxes are consistently being ignored by drivers and the former-taxi-stand is consistently holding parked taxis. No enforcement, no respect. The #56 runs too often to be consider a Walker-esque ‘coverage’ route. The Blue Line the most crowded (measured by standing passengers per car) ‘L service, right? The #56 helps keep local traffic off of the Blue Line by giving neighborhood customers a more convenient option for Milwaukee trips.
? A moment before the one below ? Yes, Stevens aerial photo at the top of the post was shot a moment before his aerial photo below, next to the Google Maps aerial. Yep except that when I scroll down to the below my eyes go to the new photo and I think the months before contrast might be better emphasized if only the older photo were below. That and I am not sure I like having my bubble image of Steven in a hot air balloon busted. I think the picture shows pretty well that the nose on the north side of the intersection should extend at least eight feet farther south, and be much wider. There is one car firmly parked in the green box in the picture. The problem is the incorrect placement of the traffic lights. To be perfectly clear, I applaud everyone who made these changes possible. Please consider a different geometry for the intersection for further improvements.